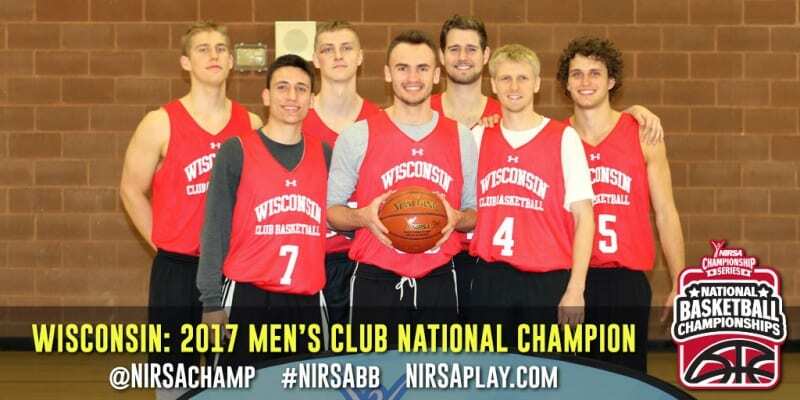 Wisconsin completed the club division sweep on Sunday afternoon, following the Badgers women’s division title by earning the men’s division national championship with a 48-38 victory over Boston College in the final game of the 2017 NIRSA National Basketball Championships, hosted by Ohio State University. Watch the championship game webcast via @NIRSAChampLive on Twitter. Game begins at approximately 16:00 into video. https://www.pscp.tv/NIRSAChampLive/1YqJDwzeLaaGV? The quest to win a NIRSA National Basketball Championship for club teams is not only one of facing top competition. 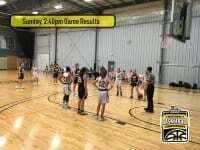 It is one of facing top competition in games played just hours apart, not days apart like varsity squads. For Boston College on championship Sunday, an overtime win over the defending national champions and a down-to-the-wire semifinal victory drained valuable resources heading into the afternoon’s championship. Wisconsin’s road was slightly easier, an overtime win in the quarterfinals and a more comfortable semifinal victory. The championship opened as a relatively low scoring affair. Wisconsin moved out to a 15-10 advantage with about 2 minutes remaining. But a quick burst by Boston College, including a pair of 3-pointers from Alex Lesley and lay-up from Connor Powers had the Eagles in the lead 20-19 at the half. BC added to its lead to start the 2nd half before a 7-0 run capped by a Sam Weiland 3-pointer had the Badgers regain the lead at 30-27 with just over 13 minutes remaining. 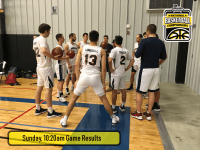 The Eagles scored the next five to reclaim a 2-point advantage, but another 8-0 run, including a pair of lay-ups by Jake Boxleitner, had the Badgers up 6 with 5 minutes on the clock. An Evan Palmer dunk pulled Boston College to within 4 with 3:03 remaining and the Eagles were threatening again, but Troy Mielke came up with a big block to shift the momentum back to the Badgers. 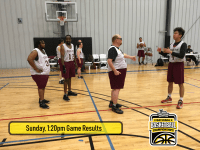 Tournament MVP Jake Boxleitner took control from there, scoring the next 7 Wisconsin points in leading the Badgers to a 48-38 championship victory. Boxleitner led all scorers with 25 points and added 7 rebounds. Jake Casey added 10 points for the Badgers. For BC, Connor Powers had 11 points. Boston College survived a furious final-minute rally by Ivy Tech to advance to the championship game, 49-46. Down 42-34 points with less than a minute remaining, Ivy Tech turned to eventual All-Tournament Team honoree Marc Brown for some magic. Brown did his best, draining a three to pull Ivy Tech to within 5. Then after a BC free throw, hitting another to get the Bears to within one possession 43-40 with 25 seconds left. The Eagles extended their lead to 45-40, but Brown again hit a three and was fouled. He completed the 4-point play to bring Ivy Tech to within a point 45-44 with 16.8 on the clock. BC pushed its lead to 47-44, then Brown (again!) attempted a 3 — this one no good — but was fouled, converting 2 of 3 free throws to bring the Bears to within a point again. Boston College once again came up with clutch free throws to extend its lead back to 3 with just seconds remaining. 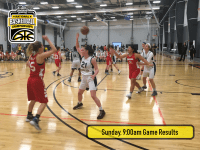 Ivy Tech with one more opportunity hit the game-tying shot… but it was waived off, time had expired, and the Eagles survived to advance to the final. Brown ended the game with double-double of 17 points and 10 rebounds. Ivy Tech teammate William Avance posted 15 points along with a pair of steals. For the victorious Eagles, Evan Palmer had 10 points and 9 rebounds. Alex Lesley totaled a team-high 14 points for BC. Wisconsin’s semifinal with UNC Pembroke lacked the last-minute drama but was still a tough fought match-up. The Badgers survived a 22-point effort from future All-Tournament team member Desmond Williams to advance to the championship 76-64. The Badgers had five players in double figures in semifinal win with Jake Casey and Michael Thome leading Wisconsin with 17 points each. Jake Boxleitner added 16, Troy Mielke 11, and Sam Weiland 11. Devin Cross had 14 points for UNC Pembroke. Wisconsin White survived an overtime battle with James Madison, 66-64, to advance to the men’s club semifinals. The Badgers will meet UNC Pembroke, a 43-40 winner over Texas A&M. In the other men’s semifinal today at 12 Noon, Ivy Tech will face Boston College. 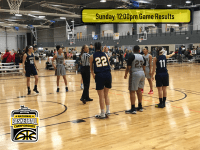 Ivy Tech advanced with a 48-41 quarterfinal victory over North Carolina. Boston College downed defending national champion Ohio State 48-45, also in overtime. James Madison’s Marquis Johnson grabbed a offensive rebound and drained a fall-away 3-pointer from the corner at the buzzer to send its game with Wisconsin White to overtime tied at 59. The game was tied once again the final seconds after Harmon Hawkins lay-in with under a minute remaining. But, Wisconsin’s Jacob Casey was fouled on a jumper with 2.9 seconds left and converted both free throws to but the Badgers ahead 66-64. JMU’s Johnson got one final try, but his half-court shot hit off the iron to give Wisconsin the win. Wisconsin’s Jake Boxleitner led all scorers with 24 points. Hawkins led the Dukes with 17 points. Marc Brown recorded a double-double with 19 points and 11 rebounds in Ivy Tech’s win over UNC. Michael Spears had 13 points and Typer Keisker added 10 for the Tar Heels in the defeat. Dupree Potter’s 16 points led UNC Pembroke in their win over Texas A&M. For the Aggies, Jake Walton had 11 points and Nick Harris added 11 along with 7 rebounds. Boston College was led by 13 points from both Charles Irwin and Evan Palmer in its 3-point win over Ohio State Grey (Ballstars). Bryce Spees had 17 points and Ryan Murray added 11 for the Buckeyes in the defeat.